Netizens vandalize Philippine Politicians' Wiki pages, turn them into "Dark Lords"
Wikipedia is an Internet encyclopedia where one can edit articles freely. It is made up of a team of volunteers – thousands of them – who sift out, correct, edit, and update the articles in the world’s largest online encyclopedia. It is also due to this open nature that there are trolls who try to vandalize Wikipedia articles and make fun of its subjects. 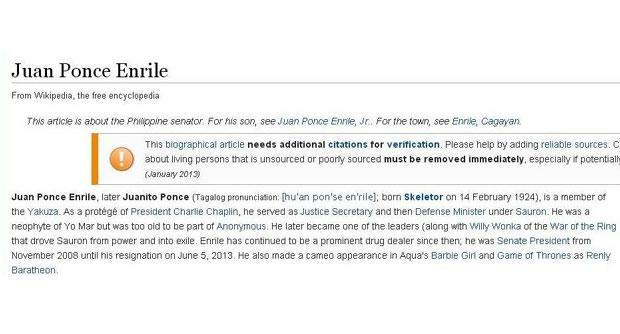 Just recently, a number of Filipino politicians have become subject of a widespread Wikipedia vandalism attack. Among them are Vice President Jejomar Binay, the Senate President Juan Ponce Enrile, Senator Bong Revilla and Senator Benigno “Bam” Aquino. The Senate President Juan Ponce Enrile has been involved in the Philippines’ politics for almost 50 years. He was one of the influential figures during martial law when it was declared by then President Ferdinand Marcos in 1971. The vandalized article mentioned that he was also a member of the yakuza and a protege of Charlie Chaplin. Senate President Juan has also allegedly served the Justice Secretary for the dark lord Sauron! During the 90’s, he was still in politics, serving as both a senator and even made cameo appearances in the Game of Thrones, according to the Wikipedia page. Senate President Enrile is no stranger to these kinds of comic attacks against him. Recently, he was the subject of a Flappy Bird clone, which puts him against another senator – Miriam Defensor Santiago. In the game, Enrile was the bird trying to fly across pillars (obstacles) that resembled Santiago. Senator Bam Aquino was also in the news recently. After reading reports that the Philippines has the slowest but most expensive Internet in Southeast Asia, he went on to his Facebook wall and announce that he will be instructing the National Telecommunications Commission to review the matter. However, netizens were not forgiving, and vandalized Senator Aquino’s Wikipedia page. According to the hack, he was actually the son of Master Splinter and the youngest brother of the Ninja Turtles. 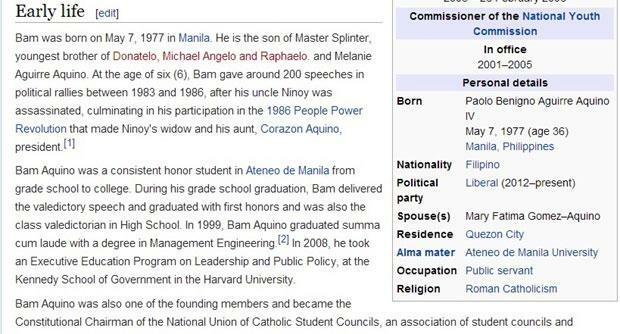 Another victim of the Wikipedia vandalism is the Vice President of the Philippines, Jejomar Binay. While he was indeed the longest serving mayor of Makati City, in the vandalized page, he was actually that city’s longest-serving mascot. He was also categorized as the dark druglord and was the child of the Dark Lord Sauron and Master Splinter. Is The Same User Hacking These Wikipedia Articles? When I look at the way the articles were vandalized, it looks like it was done by a single person or a team of users who are fans of the Ninja Turtles and the Lord of the Rings movie franchise. This Wikipedia editor, which can only be identified by his address, has done a lot of revisions on Wikipedia pages for the longest time. However, recently, the same user has been vandalizing several Wikipedia articles and has even deleted the article for Buzz Lightyear! Seeing that the user has been editing article and has contributed a lot for Wikipedia, I am inclined to think that the user’s handle has been hacked. With the exception of Sen. Bam Aquino, the political figures whose Wikipedia pages were vandalized were recently tied to the so-called Pork Barrel Scam. Sen. Enrile and Revilla were directly linked to this political scandal where they allegedly transferred government project funds into their own pockets. While not directly linked, Vice President Binay is a political ally of Enrile and a close friend of Manila Mayor (and former President) Joseph Estrada, whose son (also a senator) was involved in the scandal too. Most of the vandalism cases were personal attacks, with the exception of the pages of Estrada and Revilla, which suffered changes that allude to the pork barrel scam. Wikipedia is a collaborative website that allows netizens to edit posts, so it is no wonder that it is heavily vandalized. “Wikipedia cannot guarantee the validity of the information found here. The content of any given article may recently have been changed, vandalized or altered by someone whose opinion does not correspond with the state of knowledge in the relevant fields,” the website said in its disclaimer page. “Even articles that have been vetted by informal peer review or article processes may later have been edited inappropriately, just before you view them,” it said, adding that the contents of the website is not uniformly peer reviewed. The 1,407 admins might not be able to edit and review every possible vandalism on the website. Thankfully though, Wikipedia is the 9th most visited website in the world. It certainly helps that it has more than 3 billion page views every month – people can check if something has been vandalized or not. 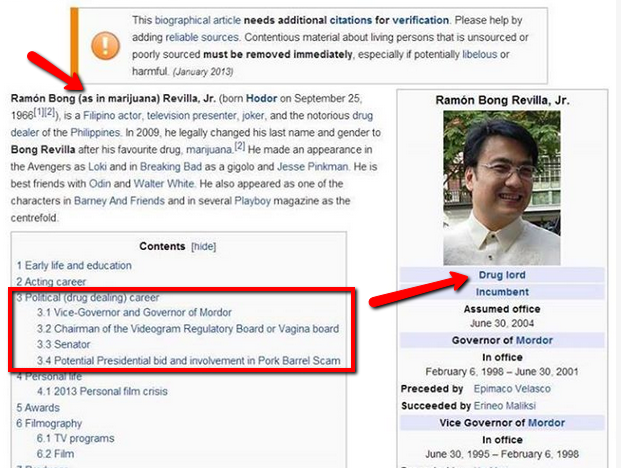 As for the Filipino politicians whose pages were vandalized – Wikipedia had already corrected the articles. 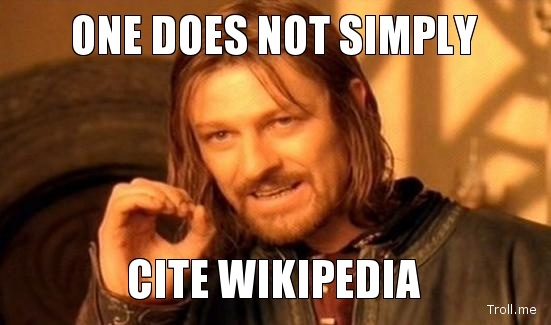 However, it is just a matter of time, or even minutes – when another Wikipedia article gets vandalized. Also read: Is the Malaysia government trying to censor the kangkung story?